The Whirlpool UltraEase dual stage replacement pre/post filter (WHEEDF) should be replaced every 6 months to keep the system working efficiently and to ensure the highest quality water is available for your family. This system is NSF certified and built in the USA. All Whirlpool under sink drinking water systems employ patented UltraEase Technology allowing for easy filter change with no hassle or mess. This system also includes an EZ-Change Indicator Light that notifies you when it is time to change filters. 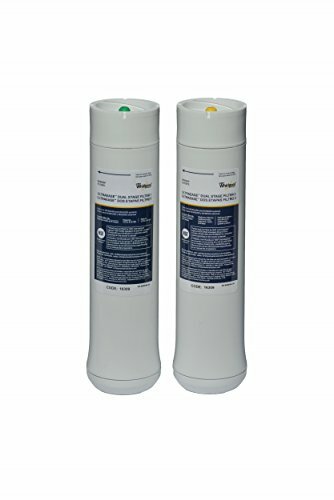 Systems WHADUS5 and WHED20 Whirlpool dual stage water filtration system reduce or remove many contaminants including chlorine taste and odor, sediment, cysts, lead and chemicals. Questions? Call the Whirlpool helpline at (866) 986-3223. Questions? Call 1-866-986-3223 for more information or text FILTER to 444999 for filter change reminders.